Pay structure discrepancies and plans of Indian Institute of Management, Ahmedabad are high points of discussions at the two-day board meeting of the institute beginning Friday at Udaipur, Rajasthan. 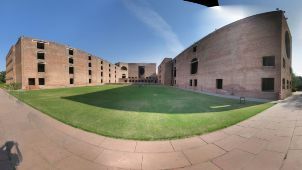 The crucial IIM-A board meeting is being held outside its campus which is a rare thing, IIM-A sources said. The Committee on Future Directions of IIM-A will present its suggestion in the meeting. CFD headed by senior IIM-A faculty member Sebastian Morris will give an outline of the institute's course of development over the next 10 years. The board is likely to discuss setting up of its satellite campus in Hyderabad for which the Andhra Pradesh government had approached IIM-A and offered land. Other major issues of discussion include objections raised by the faculty members regarding pay structure suggested by the Centre. The faculty members have asked the IIM-A management to delay the pay grid's implementation by a month.